The month of August left a hole in the heart of Asia and the world with the passing of presidents Corazon Aquino of the Philippines and Kim Dae-jung of South Korea. Their remarkable lives embodied the great struggle for democracy, justice and human rights in Asia, and will endure as an example for future generations. We dedicate this issue of Global Asia to Aquino and Kim, and pay tribute to their extraordinary accomplishments. 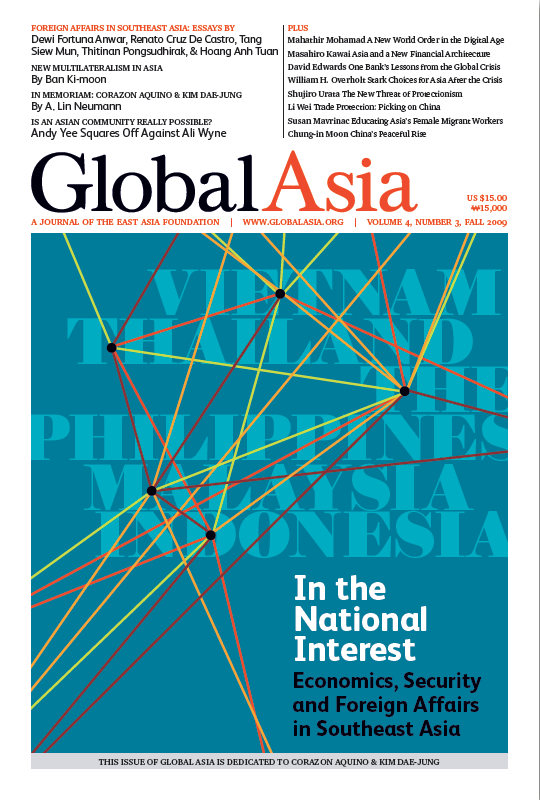 For our cover story, we worked in partnership with the East-West Center’s Washington DC office to explore the relationship between economics, security and multilateralism and the conduct of foreign policy in five key Southeast Asian nations — Indonesia, Thailand, Malaysia, the Philippines and Vietnam. Our approach was informed by a desire to pose a simple but important question: how much do a country’s economic and security relations with other nations — in the form of trade, capital and labor flows, and participation in multilateral organizations or arrangements — tell us about what to expect of its foreign policy? Together with the East-West Center, we compiled a comprehensive data set for each of the five countries — which we distilled in the foldout infographic in this issue. We then asked leading scholars in the five countries to write about their country’s foreign policy in that context. We hope you will find the results as rewarding as we did. Elsewhere in this issue of Global Asia, we feature a series of essays based on presentations made at the 5th Jeju Peace Forum held August 11-13, which was co-hosted by the East Asia Foundation, publisher of Global Asia, together with the Jeju Special Self-Governing Province and the International Peace Foundation. Several essays focus on two critical subjects that preoccupy policymakers around the world: the need for a new financial architecture in the wake of the current global crisis and the pressing urgency to combat protectionism. UN Secretary-General Ban Ki-moon writes that Asia has a particular responsibility to seek greater regional integration in order to confront the challenges ahead and enhance the region’s voice in global affairs. Former Malaysian Prime Minister Mahathir Mohamad casts doubt on the idea that the digital age will have a positive impact on the emergence of a new world order. We also feature a series of lessons on the financial crisis from a leading banker, and an essay on one organization’s attempt to educate migrant women in Asia. Our debate section poses the question: Is an Asian Community really possible? Finally, we review key books by, and about, the Chinese thinker Zheng Bijian, the architect of the theory of China’s peaceful rise. How much do a country’s economic and security relations with other nations — in the form of trade, capital and labor flows, and participation in multilateral organizations or arrangements — tell us about what to expect of its foreign policy? We examine the foreign policies of five key Southeast Asian countries in an effort to map explicit connections between the enormous amount of empirical data available on a country's national iinterest and how these countries conduct their foreign affairs. During the last half of the 20th century, Indonesia lurched from the revolutionary nationalism of founding president Sukarno to the authoritarian capitalism of Suharto. It took the end of the Cold War for Indonesia to begin to realize its potential. In perhaps no other Southeast Asian nation is the need to couple domestic political priorities with foreign policy tactics as pronounced as in the Philippines. Renato Cruz De Castro outlines how a reinvigorated alliance with the US. Malaysia has for decades illustrated how a relatively small country can have a disproportionate influence on regional and international affairs. Thailand has been praised for its adroit handling of foreign relations. While its neighbors were being colonized on all sides, it remained independent. Its skillful use of shifting alliances allowed it to maneuver through two world wars and the Cold War. It has been more than two decades since Vietnam unleashed the forces of economic and political reform, and the results are clear in the form of sustained economic progress. Is an Asian Community Really Possible? Asia has seen a proliferation of multilateral organizations in recent decades, and much of the debate over the possibility of an Asia-Pacific or East Asian community has centered on their strengths and weaknesses. Advocates for the creation of an Asian Community are confident that the 21st century will be an “Asian century,” in which the region’s rapid economic growth will unleash its potential to exercise global leadership. Increasingly, the world's problems call for global solutions. Whether these problems involve security issues, the economy or the environment, the need for Asian nations to work together has never been greater. With the growing strength of Asia's economies, there is widespread debate about the emergence of a new world order to replace the post-World War II system. Some argue that the Digital Age will help shape that new order. While the negative effects of the current global financial crisis are severe, one possible benefit is that it affords Asia a unique opportunity to step forward and take a decisive role in shaping the global financial architecture of the future. The global financial crisis has triggered a lively debate over the need to reform the world's financial architecture to better prepare for future storms. But David Edwards argues that banks themselves could do a lot more to prevent future crises. The dislocations caused by the global financial crisis have highlighted the economic relationship between Asia and the West. It remains to be seen whether efforts to deal with the current crisis are only sowing the seeds of the next crisis. Asia's export-oriented economies were particularly hard hit by the effects of the global financial crisis, as demand from major importing countries plunged in response to the crisis. The global financial crisis has triggered an acceleration in the use of protectionist trade measures, even among the G-20 countries that have pledged not to do so. China has been especially singled out as a target of protectionism. The economic potential of Asia's millions of migrant women represents one of the great untapped resources for tackling poverty, according to educator Sarah Mavrinac. Zheng Bijian is a seminal figure in the origin of the concept of China's peaceful rise. Global Asia Editor-in-Chief Chung-in Moon reviews three books by and about Zheng that document the importance of the concept. A letter from reader Richard H. Schwartz regarding Judaism, the treatment of animals and Hiranmay Karlekar's recent book Savage Humans and Stray Dogs: A Study in Aggression.